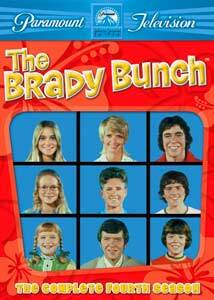 The fourth season of The Brady Bunch delivers another 23 episodes of this perennial favorite, as the Brady kids are all another year older, and facing their own crises growing up. Mike and Carol have their challenges, but often come up with some pretty clever ways of dealing with their squabbles. Judging by my familiarity with every one of these episodes, it is safe to say this was one of the more memorable seasons overall. The writing remains in top form, and the whole cast make even the weaker episodes come off well. Tiki dolls, volcanoes, swollen nasums and amateur hour are all part of the fun this time out. Like the third season's Grand Canyon trilogy, Season Four opens with a trio of location episodes where the Bradys hit the surf and sand of Hawaii on the pretext that Mike is checking out the construction of one of his projects. When Bobby finds an ancient idol, a series of unfortunate events befalls the family, leading the boys to believe the trinket is cursed. While trying to return the idol, the boys run into a disgruntled archaologist (Vincent Price), who thinks the boys will thwart his treasure-seeking plans. Greg is forced to live up to his word after being grounded for almost wrecking his mom's car (Greg gets Grounded), and has to face up to his father after writing an essay espousing his interest in following in dad's footsteps as an architect in Career Fever. He then finds himself between a rock and a hard place when he has to cast the deciding vote between Marcia and his new girlfriend in a cheerleading contest (Greg's Triangle). Marcia has a few lessons to learn about life in high school, starting with Today, I Am a Freshman, where her anxiety about going to a new school after being the most popular girl in her old one, causes her to sign up with every extracuricular activity to rebuild her popularity. Then, when the most popular boy in school asks her out, Marcia enlists Greg's advice on how to break a date with another boy, only to realize what shallowness will get you in The Subject Was Noses. In Love and the Older Man she falls for her dentist, and a mixup over the intent of his request for her availability on a Friday night doesn't help matters. Bobby gets a taste of authority when he becomes school monitor (Law and Disorder), but when power goes to his head he gets a dose of his own medicine from the rest of the kids. He also learns a thing or two about appropriate heroes when he becomes fascinated by Jesse James, much to the dismay of his parents (Bobby's Hero). And Cindy's ego becomes inflated when she beats out Bobby for an appearance on a television quiz show (You Can't Win 'em All), then enlists Peter's sleuthing skills when she loses the earrings Marcia had ordered her not to touch (The Great Earring Caper). The kids play matchmaker in a couple of episodes. First, Jan and Cindy come to the rescue when Sam chooses bowling practice over an important date with Alice, then the Brady kids conspire to get Grandma Hutchins and Grandpa Brady (Henderson and Reed in dual roles) united in You're Never Too Old. The girls are out for pay back after the boys pull a spirited stunt in Fright Night, then Peter and Bobby decide to tip the scales when Greg and Marcia battle over who gets to move into the attic in Room at the Top. Carol is reluctant to take the stage with Marcia in a parent night gala, until Mike learns he has been volunteered to pair with Greg (The Show Must Go On?? ), and after she inadvertantly squeals on the kids, Alice begins to get the cold shoulder, soon feeling her time at the Brady's has come to an end. Her replacement makes the kids realize just how fortunate they are to have a maid like Alice around in Goodbye, Alice, Hello. This season takes another shot at bundling the kids as a musical act in Amateur Nite, where the gang enter a contest to pay for the engraving on an aniversary present for their parents. Having recognized the tie in success of rival family sitcom The Partridge Family, producer Sherwood Schwartz continued to market the Brady kids beyond their television appearances, and by its fourth season, the franchising of The Brady Bunch was well under way, including a Saturday morning cartoon, The Brady Kids, which featured the voices of the primetime cast, making its debut. The kids had been given singing duties for the opening theme since the second season, and released the seasonal Merry Christmas from The Brady Bunch LP for the 1971 Christmas season. The Bradys would release three more LPs in 1972/1973. Image Transfer Review: Judging by the run times, Paramount continues to deliver these episodes as originally aired, however, like previous seasons, this does mean a few inconsistencies in image quality, especially for the restored footage. Overall, colors are well saturated and those gaudy (but once again fashionable) outfits are as eye-popping as ever. For the most part, detail and clarity are great. Some segments do have their issues, and parts of the later episodes aren't always up to par, with poorer contrast, increased grain, less sharpness, or some minor print damage, but I think most would agree that the tradeoff for complete episodes is worth any momentary degradation. Audio Transfer Review: Mono audio is very respectable. Dialogue is clear, without any excess sibilance or distortion. Frequency coverage is somewhat limited, but not to the extent that it sounds dull or thin. Some of the looping is a bit off, but there are no other major complaints. Extras Review: There are no real extras for this season, other than trailers for MacGyver, Charmed and the Oprah Winfrey 20th Anniversary DVD. Paramount seems to be listening to customer complaints in the presentation of their TV product, as this set has the option to skip the previews that on earlier sets you had to fast forward through. Only the opening Paramount logo and the copyright notice are unskippable. Inexplicably, on the first and second discs, the chapter marking within episodes doesn't allow skipping just the opening credits, with the second chapter roughly 3 minutes into the show. The third and fourth discs correct the problem. The set remains consistent in its packaging with previous seasons, again with a lenticular lens on the box cover mimicking the show's trademark opening grid. Discs are single-sided and housed in a pair of double thinpaks. The fourth season of The Brady Bunch is as enjoyable as ever, and Paramount continues to impress with the presentation, even if extras have been forgotten about since the first season.